My sister texted me this photo during an afternoon of Aunty Jenna and Milly time. I ADORE IT. That expression on her little face, looking up... ADORE. Apparently she was 'tickling' Jenna. 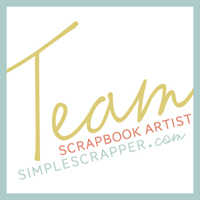 A sketch template from Simple Scrapper's August membership collection inspired the design. Being a texted copy of a phone photo, the resolution wasn't great so I decided on a smaller 6x8 inch layout. Cutting the photo into a semi-circle adds interest to the simple design. When even my sister comments that my blog name, And So I Don't Forget, is becoming ironic, it's probably time to do something about it. To break my unintentional blogging hiatus, five things there are more of and five things there are less of in my life post-Milly. More Swinging. When my little girl is on the swing in the park and she gestures for me to sit on the one next to her and swing too, I know I'm doing something right. May her wanting to share with me (everything except her half-eaten food) last for a very long time. Less Blogging. This is undeniable. Unintentional, but I seem to have got out of the habit. More Laundry. Seriously, how can one little person generate so much washing? Her clothes, bibs, tea towels that get carted around... It seems like a miracle if my clothes are still clean 10 minutes after I put them on. At least I have the most enthusiastic little helper when I do washing nowadays. Less Sleep. At the moment (because we're only one cold or new tooth away from disaster) Milly is pretty much sleeping through the night, 7pm to 6:30am or thereabouts. Last night she needed a cuddle at 2:30am but I was out of bed for 3 minutes at most. The days of sleeping in though, they seem long gone. More Animal Noises. Baa, moo, cluck, woof... From reading favourite books, where she'll turn straight to the last page and point to each of the animals for you to name and sound, to Old MacDonald Had a Farm, to encouraging her - 'What noise does a sheep make Milly?' - I have never been more knowledgeable on animal noises in my life. Still can't do a credible elephant though! Less Scrapbooking. My Simple Scrapper commitments have meant at least a scrapbook layout or two each month, even if I haven't been sharing them, but I've barely managed anything beyond that. My 2016 December Daily is currently languishing at Day 12, and that's Milly's first Christmas. More Videos. For Milly's first year, I tried to take a short video on my phone each day. I didn't have a perfect record but I do have hundreds of snippets of my growing baby girl that I try to add to regularly. I've never been a huge video fan in the past but these make my heart melt. More Getting a Coffee. From taking a walking with Milly there in nice weather to an escape from the house on a gloomy afternoon, my local coffee shop has seen a lot more of me this past year. Less Scheduled TV. Probably a combination of Netflix subscription, other things to do in those precious evening sans-kid hours and uninspiring offerings on commercial TV that I can watch on their website later anyway, but I watch way less of the free-to-air TV stations than I used to. Fingers crossed for starting a new blogging habit.